Nymphs were minor goddesses in Greek mythology, and were often personifications of features from the physical world that the Ancient Greeks found themselves in. As such, nymphs such as the Oceanids, were goddesses associated with water sources such as springs and wells. Another group of nymphs were the Hesperides, the Greek goddesses of evenings and sunsets. 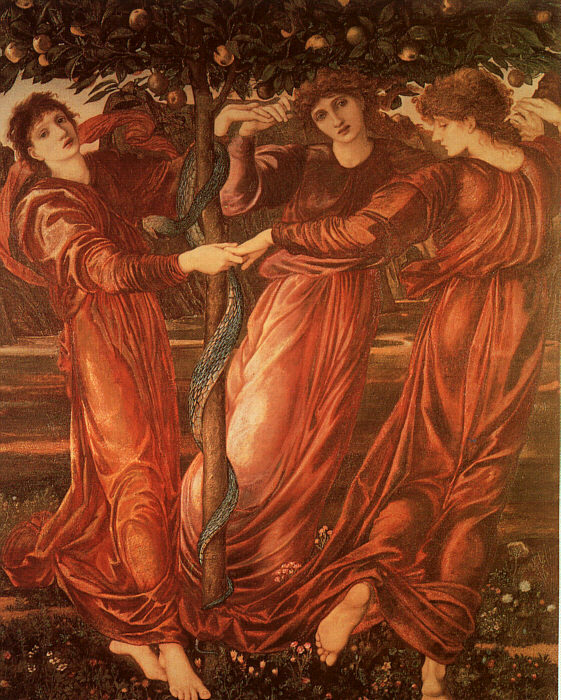 The Hesperides are generally thought to be the daughters of the goddess Nyx (Night), and as goddesses associated with the evening and sunsets this would make sense, for deities such as Aether (Air) and Hemera (Daylight) were also daughters of Nyx. This parentage indeed is given by Hesiod in the Theogony¸ and agreed by Hyginius (Cicero De Natura Deorum), although Hyginius also names Erebus (Darkness) as the father of the Hesperides. To reconcile other tales in Greek mythology though, other writers name Atlas as the father of the Hesperides, with Hesperis (Evening) as their mother. There is an argument about just how many Hesperides there were, with ancient sources proclaiming three, four or seven Hesperides; and of course as a result there is no consensus upon the names of the Hesperides either. Combining ancient sources, eight different names of Hesperides nymphs can be ascertained. Hesiod’s Theogony is normally the main source for looking at the genealogy of the Greek gods, and the Greek writer named three Hesperides – Aegle, Erythea and Hesperethusa. 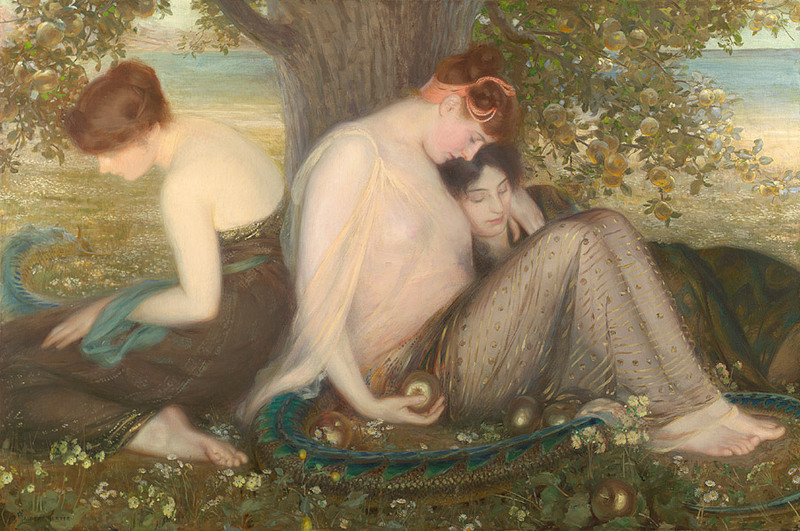 In keeping with other nymphs, the Hesperides were considered to be very beautiful, with the Hesperides particularly noted for their singing ability, with some of the sweetest songs ever composed emanating from the lips of the nymphs. 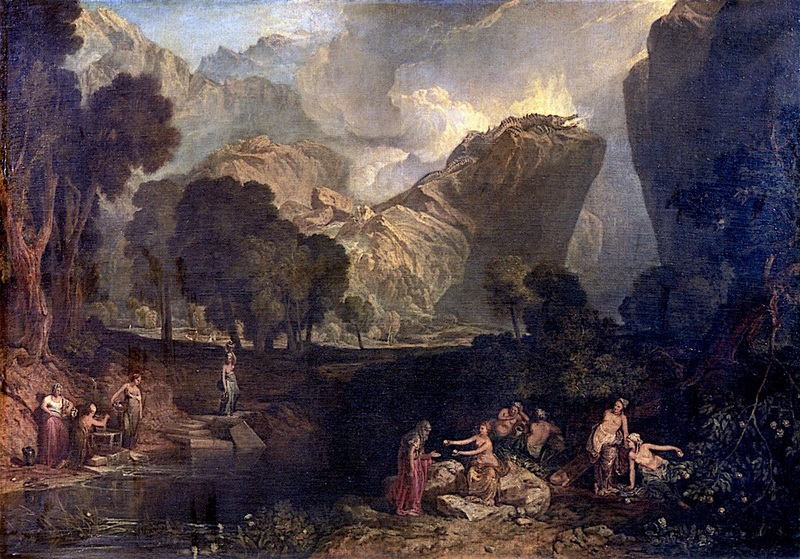 The role of the Hesperides in Greek mythology though, was as guardians, for these nymphs tended the Garden of Hera (or the Garden of the Hesperides). The Garden of Hera was a sacred place, and was famously home to the Golden Apples of Greek mythology, and possibly an orchard grown from the original Golden Apples. The original golden apples had been presented to Hera by the goddess Gaia, when Hera had wed Zeus; and it was the Golden Apples that was said to give the golden tinge of sunsets. The Garden of Hera was home to more than just an orchard and plants though, for it was also a hiding place for many powerful tools of the gods, including Hades’ helmet of invisibility, Athena’s shield, and the sandals of Hermes. The Golden Apples, and the tools, were incredibly valuable and so guarding them was not left purely down to the Hesperides, and they were joined in the Garden of Hera by a hundred-headed dragon named Ladon. Any potential thief though had to find the Garden of Hera before they even thought about taking anything from it. The exact location of the Hesperides was never revealed. With the sun setting in the west, it was of course apparent that the home of the Hesperides must be in the far west, and so an island home was said to exist in the domain of Oceanus, this island was named both Erytheia (Red) and Hesperia (Evening). Later on alternative locations were given in Southern Spain and Northern Africa, with a location near to Mount Olympus often quoted. The location of the Garden of Hera and the Hesperides could of course not be a total secret for the major gods obviously visited to deposit and remove the hidden articles there; and there are several myths about unexpected visitors to the Garden of Hera. Strangely enough though, the Hesperides do not appear prominently in any of these stories, and the nymphs might not have been the best guardians of the garden. The most famous story about the Garden of Hera sees the visit of Heracles, for the Greek hero had been tasked by King Eurystheus, as the 11th Labour, to bring back some of the Golden Apples from the garden. Heracles firstly discovered the location of the Garden of the Hesperides by either wrestling Nereus, one of the older sea gods, or by asking the Titan Prometheus for the information. Heracles then sought out the help of Prometheus’ brother Atlas. The help given by Atlas depends on the version of the story being read, either the Titan simply told Heracles how to enter the garden and get passed the Hesperides (possibly Atlas’ daughters, or Atlas did the entering of the garden himself. In the later version of the myth, Heracles of course had to hold the heavens aloft in place of Atlas, whilst Atlas stole the Golden Apples; Heracles would have to then trick Atlas in to trading places again. Subsequently, Heracles would be aided by the goddess Athena, for the goddess was said to have returned the Golden Apples into the care of the Hesperides after the completion of the Labour. Generations before the tale of Heracles though Perseus, the great-grandfather of Heracles, was said to have visited the Garden of Hera. ​Perseus was on a quest to acquire the head of the Gorgon Medusa; thus Perseus was not after the Golden Apples but was instead looking for weapons to achieve the quest. Perseus though was being aided by several gods of Mount Olympus, and so it would seem that Hermes and Athena brought Perseus to the home of the Hesperides, and presented the Greek hero with the weapons needed to succeed in his quest. One other famous visitor to the Garden of Hera would have to be the Greek goddess Eris, goddess of Discord, for Eris would have in her possession one of the Golden Apples when she attended, without invite, the wedding of Peleus and Thetis. The Golden Apple would have inscribed upon it the words “for the fairest”, and after being thrown amongst the assembled guests at the wedding would produce an argument amongst the goddess Aphrodite, Hera and Athena. The throwing of the apple was one of the starting points of the Trojan War, but as to how the Golden Apple was acquired by Eris is never told. It could of course simply have been given to her by Zeus, for some say that the Trojan War was a plan of Zeus’ to bring the Age of Heroes to an end.